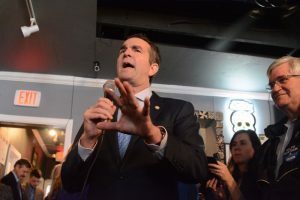 Northam contrasted his stances on social issues—which include protections and inclusion for LGBT people, defense of Planned Parenthood funding, and “common sense gun laws”—with President Donald J. Trump’s 2016 campaign. Democrats are hoping to ride a wave of backlash against Trump to reclaim governorships and legislative seats around the country, particularly in districts that Hillary Clinton won in the 2016 election. Clinton and her vice presidential candidate, U.S. Sen. Tim Kaine (D-VA), beat Trump in Virginia by five points in 2016, doing particularly well in Northern Virginia. “I will remind all of you that the pendulum in this business swings hard and fast, and this is our time to build our party, to build our base,” Northam said. Opening for Northam, Virginia Sen. Jennifer T. Wexton (D-33) said the stakes in 2017 are high for Democrats. 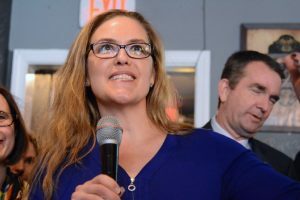 She said one of the reasons Republicans carry a 64-33 majority in the House of Delegates is that “it’s hopelessly gerrymandered.” Wexton pointed out that the governor elected in 2017 will preside over Virginia’s decennial redistricting. Several bills intended to address redistricting, including one this year to create a nonpartisan redistricting commission, have failed in the General Assembly in the past several years. Northam particularly emphasized gun control and LGBT protections in his stump speech, bringing up major sporting events and companies that moved out of North Carolina in the wake of that state’s controversial “bathroom bill,” requiring that transgender people use the bathroom of their gender at birth. Some of those events and companies, he pointed out, came to Virginia. He was introduced by Andrew Goddard, who has been a prominent face in lobbying for tighter gun control laws since his son sustained serious injuries after being shot in the 2007 Virginia Tech massacre that left 32 people dead. Northam drew on his professional experience in making his case. Northam, a pediatric neurologist, former Virginia senator, and Desert Storm veteran, is competing with attorney, diplomat, and former congressman Tom Perriello for the Democratic Party nomination for Virginia governor. Democratic primary elections for the November general election will be held June 13. I wonder why Northam didn’t mention all the composite index in his stump speech. He could have thanked all of us gullible NOVA citizens for sending so much $$ down to him and his bureaucrats in Richmond for them to hand out to all the other Virginia counties. I wonder why Northam didn’t mention how McAuliffe is fighting to keep criminal aliens in the state. 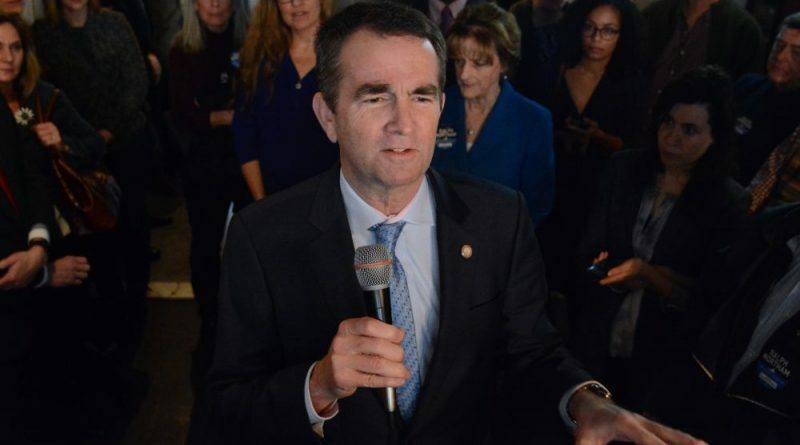 Why he could have explained how so much of our local tax $$ are going to pay for the education and healthcare of illegal aliens who Northam and MAuliffe protect. Interesting, how some people still do not know how our state government works. Some seem to believe that the governor is the one decides how the state spends money. Guess what, it is the General Assemble who passes the state budget. And guess what, some seem to think that it is the lieutenant governor who distributes budge money throughout the state. Again, wrong. Maybe civil education should be mandatory for those people. Funny how Democrats blame everything other than themselves for losing again and again. Democratic policies are so bad that even Northam voted for George W. Bush. Twice!! !